The OS 4.3 update to iPads, iPhones, and iPods expanded its Apple Airplay capabilities. AirPlay lets you send music or video from your iDevice to an Apple TV. This update allows users to stream video from many third-party apps, not including Apple or Apple iTunes. While you can find lists of AirPlay-enabled apps, many others not found on these lists can send video from your iPad, iPhone or iPod. Moreover, some of the apps on the Airplay-enabled lists either don't send video or are inconsistent. There are a number of apps that have video. There are how-to apps that display video on your iPhone — fitness videos and beauty videos, for example. There are apps that stream videos from online, including "My DailyClip" and "PBS." There are apps that can share media from media libraries on network-attached storage device (NAS) drives, media servers, or other computers. These videos can play on your iPad, iPhone, and iPod. AirPlay can send them to your TV so you aren't limited to the small screen. There are also a number of third-party music apps — "Napster" (now a part of Rhapsody, "Slacker Radio — that can now stream music to an Apple TV through AirPlay. 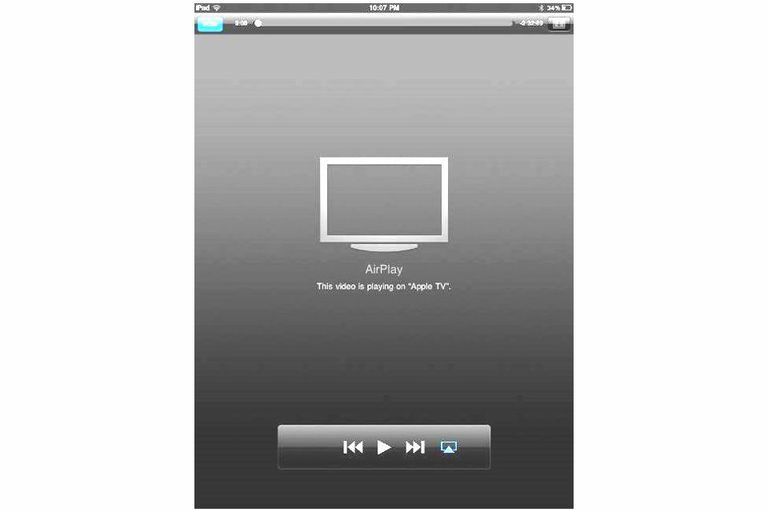 AirPlay's ability to stream third-party apps adds a new dimension to both the iPhone/iPod Touch or iPad, and to the Apple TV. The iDevice becomes a controller that receives the media and sends it on to the Apple TV. Unlike other network media streamers, Apple TV has offered a very limited number of content partners from which you can stream, relying on the iTunes store instead. The ability to stream from a number of third-party iPhone/iPad apps expands the content that can be streamed through the Apple TV. In a perfect world, AirPlay would stream videos from video apps and audio from music apps. However, it doesn't work that way. Some video apps will play video on the device and only stream the audio to your TV/stereo. It is odd to watch an action movie on a small screen while the music and sound effects surround you and fill up the room. Some video apps have been programmed to send full high-definition video to your Apple TV. Apps that don't stream their videos directly, and connect to YouTube to play videos, have some of the best picture quality. Other apps play videos that have been formatted for your device. On a 5-inch or 8-inch screen, these compressed videos look fine. But when you play that same video on a 40-inch or 50-inch big screen, it can become so blurry and filled with boxy interference (artifacts) that it becomes almost unwatchable. Again, some apps send audio and some send video to the Apple TV. If you start playing a video and tap the AirPlay icon, it will bring up options to where you can stream. First, it will list the device itself — iPhone/iPad/iPod — with an icon of a TV, meaning that it will play the video. And it will list the Apple TV with one of two icons — a TV, meaning that it will stream video, or an icon of a speaker, meaning that it will stream the audio and the video will play on the device. From time to time, an error message will pop up on the iPhone or iPad, reading, "Cannot play video on 'Apple TV'." Simply tapping the video play button or the AirPlay icon again often would engage AirPlay and stream the video. There is one more issue in streaming video to Apple TV. The video must be in a file format that the Apple TV can play. Apple TV is set up to play music and videos from iTunes. Windows media files, avi files, and mkv (matroska) files cannot be played on an Apple TV. This means that even though media-sharing apps like "Plug Player," "Plex" and "iMedia Suite" can access your media libraries outside of iTunes the files will not be able to play on the Apple TV. Which Apps Stream Video, Which Stream Audio, and How Well Do They Work? There are probably hundreds or even thousands of iPhone and iPad apps that play video. The only way to know if an app will stream video using AirPlay is to play it on your iPhone/iPod Touch or iPad and press the AirPlay icon. and press the AirPlay icon. Here are some apps that play video, some that play audio, and how well they performed. YouTube can be streamed without fail to the Apple TV. It can play HD video and looks great. Still, the Apple TV can connect to YouTube without streaming from an iPhone or iPad, so it's more of a convenience if you were watching on your iDevice and wanted to spontaneously share a video. Fitness and How-To Video Apps — "Authentic Yoga with Deepak Chopra," "Fit Builder," and "Fitness Class" are three examples of apps that can send video to the Apple TV. While “Authentic Yoga” videos appeared clear, the “Fitness Class” videos were hard to watch because of the artifacts created when enlarging a video intended for the small screen. Other fitness video apps like "Howcast" and "Cook's Illustrated," can only send audio to the Apple TV. Apps with Movie Trailers — "IMDB," "Fandango," and "Flixster" play trailers on the Apple TV in beautiful high definition. Trailers from the HBO app would only play audio on the Apple TV. HD Video Apps — Other "HD" apps may be sharp on an iPad, but suffer from jagged and blurry edges and other compression artifacts. "PBS," "My Daily Clip," and "Vevo HD" music videos had this problem. Videos in Interactive Magazines — Many digital magazines use videos in ads and articles. “Popular Mechanics” magazine has its own app and plays video easily to the Apple TV. Interactive magazines like "National Geographic," in the Zinio Magazine app, likewise play video easily. The videos, however, suffer the effects of file compression. Media Sharing Apps — "iMedia Suite" and "Plug Player" can send video to the Apple TV, but this is limited to the compatible file formats — .mov, .mp4 and .m4v. "Plex" can play videos stored on a Mac that is running the "Plex" server software. Through AirPlay, Plex adds even more quality content to your Apple TV. Plex can stream a number of channels: NBC, CBS, The WB, and USA TV shows; Food Network episodes and clips; Hulu; "The Daily Show;" Netflix; Picasa; Ted Talks; and your TiVo recordings from your network-connected TiVo box. "Air Video" is a file-sharing app that fixes the problem of incompatible file formats. Air Video finds files available on a Mac or PC that is running the Air Video Server. It can live-convert the file as it plays, and stream it using AirPlay to the Apple TV. Air Video truly turns your Apple TV into a complete network media player that can play all of the media stored on your computers and home network. AirPlay expands the content that can be streamed to your Apple TV and played on your home theater system. The quality of the video often is not as good as the quality of video streamed from iTunes to Apple TV. There are many bugs and glitches. If you want to add to the limited content available on Apple TV, using AirPlay will help. The list here is certainly only a partial list of apps with video that can be streamed to the Apple TV. However, AirPlay may not be your best solution when choosing a network media player. If you want more content channels (apps) for a network media player, you'll want to choose another player — Roku or Boxee or the Sony Media Player — that have an ever-growing number of content partners. If most of your media libraries are stored outside of iTunes on media servers, NAS drives or in Windows Media Center, you should consider a network media player that can play a wide range of file formats like the WD TV Live Hub.